Women: Against capitalism - For a socialist world! The ’World March of Women’ is a cry for justice on the part of half the world’s population. On International Women’s Day - March 8 - this year, demonstrations were held in more than 50 countries in every continent. THE CWI, Committee for a Workers’ International, sends May Day greetings to the working class and oppressed peoples of the world. Working women around the world have a right to expect a new century, especially a new millennium, to bring them a better deal in life. After all, the 20th century saw unimagined strides forward in science, medicine and technology and even in attitudes towards women in society. THE CWI, the Committee for a Workers’ International, an international socialist organisation with affiliates and co-workers in 35 countries on all five continents, sends it warmest May Day greetings to the working people of all countries. 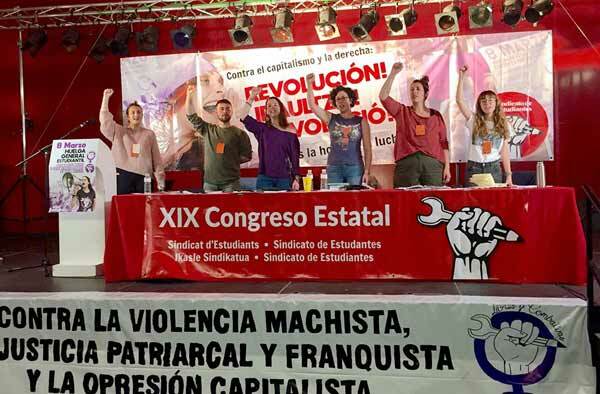 The committee for a workers’ international commemorates International Women’s Day 1999 - Monday 8th of March - by calling on all socialists and class fighters to help restore the true significance of this day in the calendar of the workers’ movement. Workers and Socialists all over all world are celebrating May Day this year against the background of darkening economic clouds and the bright light of what could be one of the most significant victories the labour movement has won one for some time. Contact us, join the CWI!